What can I say about punch? It’s simple, it’s yummy, it’s cheap, and it’s a great way to get people drunk. In a bowl, mix lemonade, limeade, ginger ale, and champagne. Stir together. 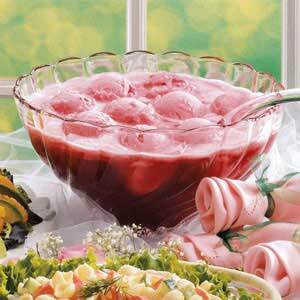 Before serving, float scoops of raspberry sherbet on top. Enjoy! Stir together all ingredients in a 2-quart pitcher. Serve. Tie spices in cheesecloth; set aside. Bring water to a boil over high heat in large stockpot. 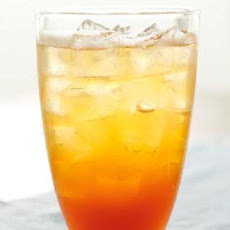 Remove from heat, then add Lipton® Iced Tea Brew Family Size Tea Bags and spices; cover and brew 5 minutes. Remove Tea Bags and squeeze. Stir in brown sugar, then cranberry juice and wine. Cook covered until heated through. Remove spices. Serve warm. 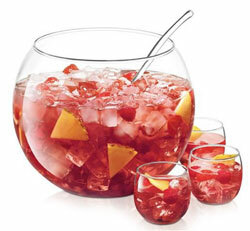 Mix ingredients in a punch bowl, chill, and serve over ice. Previous On the seventh day of Christmas, Drink Matron gave to me: Mulled Wine and Cider!